Chlorpromazine (as chlorpromazine hydrochloride, abbreviated CPZ) is a phenothiazine antipsychotic. Its principal use is in the treatment of schizophrenia, though it has also been used to treat hiccups and nausea. Its use today has been largely supplanted by the newer atypical antipsychotics such as olanzapine and quetiapine. Chlorpromazine works on a variety of receptors in the central nervous system; these include anticholinergic, antidopaminergic and antihistamine effects as well as some antagonism of adrenergic receptors. Chlorpromazine, along with many of the older antipsychotics which have minimal effect on the serotonergic pathways, is considered a typical antipsychotic. Its receptor affinities result in a side-effect profile that is predominantly anticholinergic in nature: constipation, sedation, hypotension, and antiemetic properties. It also has anxiolytic (alleviation of anxiety) properties. Extrapyramidal side-effects that are common in many antipsychotics may occur, but are ameliorated by chlorpromazine's anticholinergic activity. They include akathisia and parkinsonian tremor, which can be very unpleasant though reversible. A more chronic side-effect is tardive dyskinesia, which may be irreversible in some patients. Neuroleptic malignant syndrome is a rare though potentially fatal outcome of any antipsychotic use about one in two thousand (0.05%) patients taking chlorpromazine may develop it. Originally sold in the 1950s and 1960s, under the trade names Largactil and Thorazine, chlorpromazine was the first drug to come into use as an antipsychotic, and was the prototype for the phenothiazine class, which later grew to comprise several other agents. It is often administered in acute settings as a syrup, which has a faster onset of action than tablets. Parenteral administration is not generally recommended. The drug had been developed by Laboratoires Rhone-Poulenc in 1950 but they sold the rights in 1952 to Smith-Kline & French (today's GlaxoSmithKline). GlaxoSmithKline has since discontinued the drug and it is now only available as a generic drug. The drug was being sold as an antiemetic when its other use was noted. Smith-Kline was quick to encourage clinical trials and in 1954 the drug was approved in the US for psychiatric treatment. The effect of this drug in emptying psychiatric hospitals has been compared to that of penicillin and infectious diseases. Over 100 million people were treated but the popularity of the drug fell from the late 1960s as the severe extrapyramidal side effects and tardive dyskinesia became more of a concern. From chlorpromazine a number of other similar neuroleptics were developed (e.g. triflupromazine, trifluoperazine). Previously used as an antihistamine and antiemetic its effects on mental state were first reported by the French doctor Henri Laborit in 1951 or 1952 (different sources) as sedation without narcosis. It became possible to cause 'artificial hibernation' in patients, if used as a cocktail together with pethidine and hydergine. Patients with shock, severe trauma or burns, become, if treated so, sedated, without anxiety and unresponsive/indifferent to painful external stimuli like minor surgical interventions. The first published clinical trial was that of Jean Delay and Pierre Deniker at Ste. Anne l in Paris in 1952, in which they treated 38 psychotic patients with daily injections of chlorpromazine. Drug treatment with chlorpromazine went beyond simple sedation with patients showing improvements in thinking and emotional behaviour. 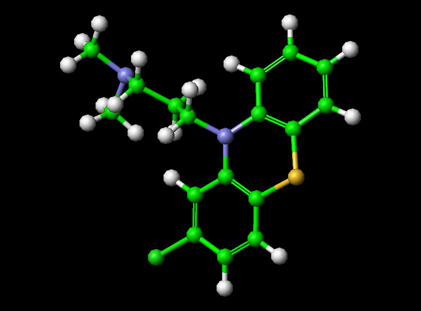 Antipsychotic properties of chlorpromazine appear to be unrelated to its sedative properties. During long term therapy some tolerance to the sedative effect develops. Chlorpromazine substituted and eclipsed the old therapies of electro and insulin shocks and other methods such as psychosurgical means (lobotomy) causing permanent brain injury. Before the era of neuroleptics, starting with chlorpromazine, positive long-term results for psychotic patients were only 20%. Chlorpromazine is derived from phenothiazine, has an aliphatic side chain, typical for low to middle potency neuroleptics. The oral bioavailability is estimated to be 30â€“50% due to extensive first pass metabolism in the liver. Its elimination half-life is 16â€“30 hours. It has many active metabolites (approximately 75 different ones) with greatly varying halflives and pharmacological profiles. The cytochrome P450 isoenzymes 1A2 and 2D6 are needed for metabolism of chlorpromazine, and the 2D6 subtype is inhibited by chlorpromazine (NB: possible interactions with other drugs). M1 and M2 muscarinic acetylcholine receptors (causing anticholinergic symptoms such as dry mouth, blurred vision, constipation, difficulty or inability to urinate, sinus tachycardia, electrocardiographic changes and loss of memory, but the anticholinergic action may attenuate extrapyramidal side effects). Additionally, chlorpromazine is a presynaptic inhibitor of dopamine reuptake, which may lead to (mild) antidepressive and antiparkinsonian effects. This action could also account for psychomotor agitation and amplification of psychosis (very rarely noted in clinical use). Chlorpromazine is an antagonist to H1 receptors (provoking antiallergic effects), H2 receptors (reduction of forming of gastric juice), M1 and M2 receptors (dry mouth, reduction in forming of gastric juice) and some 5-HT receptors (different anti-allergic/gastrointestinal actions). Because it acts on so many receptors, chlorpromazine is often referred to as a "dirty drug", whereas the atypical antipsychotic amisulpride, for example, acts only on central D2 and D3 receptors and is therefore a "clean drug". Research still needs to be done to understand the implications of this fact. The main side effects of chlorpromazine are due to its anticholinergic properties; these effects overshadow and counteract, to some extent, the extrapyramidal side effects typical of many early generation neuroleptics. These include sedation, dry mouth, constipation, urinary retention and possible lowering of seizure threshold. Appetite may be increased with resultant weight gain, Glucose tolerance may be impaired. Photosensitivity may occur, resulting in increased risk of sunburn. Tardive dyskinesia and akathisia are less commonly seen with chlorpromazine than they are with high potency typical antipsychotics such as haloperidol or trifluoperazine, and some evidence suggests that, in conservative dosing, the incidence of such effects with chlorpromazine may be comparable with that of newer agents such as risperidone or olanzapine.. A particularly severe side effect is neuroleptic malignant syndrome which occurs in approximately 0.05% of those taking chlorpromazine and can be fatal. Other reported side effects are rare, though severe; these include a reduction in the number of white blood cellsâ€”referred to as leukopenia or, in extreme cases, even agranulocytosis, which may occur in 0.01% of patients and lead to death via uncontrollable infections and/or sepsis. Chlorpromazine is also known to accumulate in the eye in the posterior corneal stroma, lens, and uveal tract. Because it is a phototoxic compound, the potential exists for it to cause cellular damage after light exposure. Research confirms a significant risk of blindness from continued use of chlorpromazine, as well as other optological defects such as color blindness and benign pigementation of the cornea. Chlorpromazine is the neuroleptic drug with the highest rates (0.5% to 1%) of liver toxicity of the cholestatic type. The sedation effect combined with indifference to physical stimuli, anecdotally known as the "thorazine shuffle," has long been associated with the drug. The image of psychiatric patients staggering mute around a padded cell has earned those particular side effects a place in mainstream pop culture. Chlorpromazine intensifies the central depressive action of drugs with such activity (tranquilizers, barbiturates, narcotics, antihistamines, OTC antiemetics etc.) A dose reduction of chlorpromazine or the other drug may be necessary. Chlorpromazine also intensifies the actions and undesired side effects of antihypertensive drugs and anticholinergic drugs. The combination of chlorpromazine with other antipsychotics may result in increased central depression, hypotension and extrapyramidal side effects, but may sometimes enhance the clinical results of therapy. The anti-worm drug (antihelminthic) piperazine may intensify extrapyramidal side effects. In general, all neuroleptics may lead to seizures in combination with tramadol (Ultram). Chlorpromazine may increase the insulin needs of diabetic patients. Drugs such as SSRIs, St. John's Wort and barbiturates can inhibit various CYP isoenzymes, such as CYP2D6, which are needed for the metabolization of chlorpromazine and/or its metabolites. Theoretically, this should increase the half-lives of chlorpromazine and possibly its metabolites, making dosing changes necessary. The exact clinical significance of this enzyme induction and its therapeutic consequences are unknown at present time and remain to be evaluated. Chlorpromazine is primarily used as an antiemetic in dogs and cats. It is also sometimes used as a preanesthetic and muscle relaxant in cattle, swine, sheep, and goats. It is generally contraindicated for use with horses, due to a high incidence of ataxia and altered mentation. In any case, use is determined by an attending physician. The following information is intended to serve as a guideline: A wide range is covered from 25 mg oral or intramuscular for mild sedation, every 8 hours, up to 100 mg every 6 hours for severely ill patients. Different qualified sources give 800 mg/day to 1,200 mg/day as highest dose. There has been at least one small clinical trial in treatment-resistant patients with a daily dose of 1,200 mg chlorpromazine (and 4 mg Benztropine to counteract early extrapyramidal side effects, which were anticipated with this unusual high chlorpromazine dose). Initial doses should be low and be increased gradually. It is recommended that most of the daily dose (e.g. 2/3) is given at bedtime for maximum hypnotic activity and minimal daytime sedation and hypotension. In the USA there are controlled release forms of chlorpromazine (e.g. 300 mg). After the individual dose is well established, such a CR capsule can be given with the evening meal as a single dose, covering the next 24 hours. It is often administered in acute settings as a syrup, which has a faster onset of action than tablets. The lowest dosage compatible with good therapeutic effect should be given. Dosage in ambulatory patients should be particularly low (minimizing sedation and hypotension). The direct i.v.-injection of undiluted solution is contraindicated (massive fall in blood pressure, cardiovascular collapse), for i.v.-infusion of dilutions the (hospitalized) patient should be lying and the infusion rate should be as slow as possible. Afterwards the patient should rest in the lying position for at least 30 minutes. Intramuscular administration is generally not recommended due to the unpredictable absorption and hence widely varying effect. The injection has been reported to be uncomfortable or painful and cause sterile abscesses. All patients treated with chlorpromazine on a long-term-basis should have the following checked regularly: blood-pressure, pulse rate, laboratory-tests (liver function tests, kidney-values, blood cell counts, ECG and EEG. Some side effects seem to appear more frequently during the first months of therapy (sedation, hypotension, liver damage) while others do not (e.g. tardive dyskinesia). At regular intervals the treating physician should evaluate whether continued treatment is needed. The drug should never be discontinued suddenly, due to unpleasant withdrawal-symptoms, such as agitation, sleeplessness, states of anxiety, etc. (which should not be construed as stemming from psychological or physical dependence). The dose should rather be slowly reduced at a rate of approximately 20-25% per week. Chlorpromazine is classified as a low-potency antipsychotic and in the past was used in the treatment of both acute and chronic psychoses, including schizophrenia and the manic phase of bipolar disorder as well as amphetamine-induced psychoses. The use of chlorpromazine has been largely replaced by newer generation of atypical antipsychotics which are generally better tolerated. Recent global review of data supports its effectiveness as an antipsychotic. It has also been used in porphyria and as part of tetanus treatment. It still is well recommended for short term management of severe anxiety and aggressive episodes.Resistant and severe hiccups, severe nausea/emesis and preanesthetic conditioning have been other indications in the past.It can be used to treat amphetamine overdose. Chlorpromazine is occasionally used off-label for treatment of severe migraine. Sometimes it is used in small doses to improve nausea/emesis opioid-treated cancer patients encounter and to intensify and prolong the analgesic action of the opioids given. Interestingly, it remains controversial whether or not chlorpromazine has its own analgesic properties. Analgesic properties may result from a central action on the hypothalamus; the patient may feel the pain much less than before. Other mechanisms may be an interaction with opioid receptors centrally and/or in the spinal cord. Some experts on the contrary say that chlorpromazine, like other phenothiazines, may even have antianalgesic properties. Chlorpromazine has been proposed as useful in newborns for the treatment of opioid withdrawal, if the mother was opioid-dependent. The latter indication remains highly controversial. It has a unique action in cholera, reducing the loss of water by approximately 30%. In Germany, the brand of chlorpromazine drug PropapheninÂ® has additional indications for insomnia and itching skin disease. Some jurisdictions in the United States use Thorazine as a sedative/tranquilizer prior to carrying out a death sentence by lethal injection. The condemned may be offered the sedative and some states require that it be administered, even against the wishes of the condemned. Was used in the 1970's as a treatment for Hyperactive children as a means of calming them down. Diaz, Jaime. How Drugs Influence Behavior. Englewood Cliffs: Prentice Hall, 1996. Turner T. (2007). "Unlocking psychosis". Brit J Med 334 (suppl): s7. Adams CE, Awad G, Rathbone J, Thornley B (2007). "Chlorpromazine versus placebo for schizophrenia". The Cochrane Database of Systematic Reviews (2). John Wiley and Sons, Ltd.. doi:10.1002/14651858.CD000284.pub2. ISSN 1464-780X. Haloperidol. Physicians' Desk Reference. drugs.com (2007). Retrieved on 2007-06-02. Amphetamine Overdosage & Contraindications. RxList.com (2007). Retrieved on 2007-06-02. Baldessarini, Ross J.; Frank I. Tarazi (2006). "Pharmacotherapy of Psychosis and Mania", in Laurence Brunton, John Lazo, Keith Parker (eds. ): Goodman & Gilman's The Pharmacological Basis of Therapeutics, 11th ed., New York: McGraw-Hill. ISBN 978-0071422802. Methods of Execution. Clark County, IN Prosecuting Attorney web page. Retrieved on 2007-03-13.